The biggest problem we have is that the media focuses on drastic stuff to capture viewers irrespective of the truth or impact. The latest is the cop who they are now hunting for who killed three people. Watching the news it seems as though violence is getting worse. In fact, it has diminished greatly. On an empirical basis murder rose with the abandonment of Bretton Woods in 1971 and the 1970’s was a hard time of stagflation where real wages declined like we are seeing today. However, population has been rising and when we factor the empirical number of murders that has been declining anyway, it shrunk dramatically with the economic boom after the peak in the ECM Public Wave in 1981. On an empirical level, the sheer number of murders peaked in 1994.25 with the bottom in the ECM where the US Share Market bottomed precisely to the day with that model. More importantly, this is where South East Asia peaked after Japan in 1989.95 and despite the political nonsense, job growth in the USA began to rise and as it did the number of murderes declined sharply. 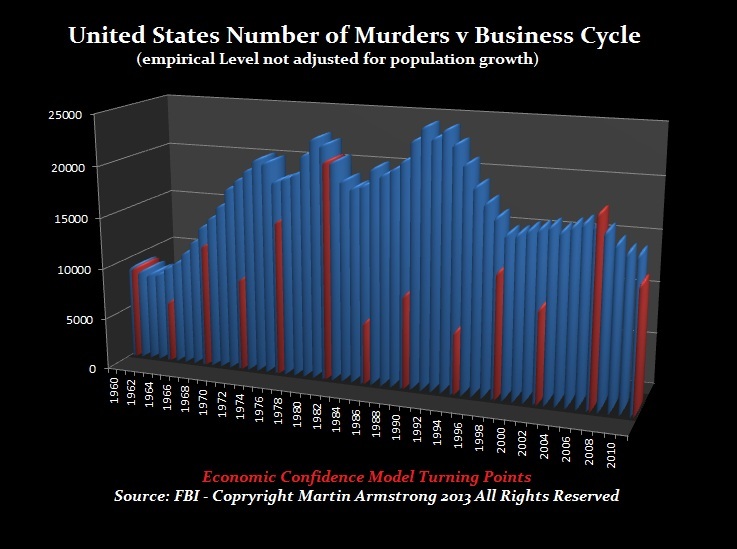 It appears that there is a better than 80% correlation between violent crime and the business cycle. This makes sense as economic times get worse, marriages break-up in divorce with the #1 reason being money. The murder rate follows the same pattern. This feeds in to the upturn we see starting in 2014 as civil unrest.